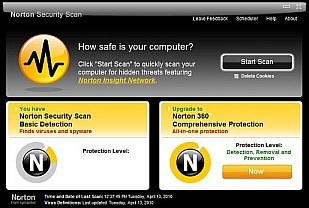 Review: Norton Security Scan utilizes Symantec’s award winning antivirus protection engine which is also used in their Consumer and Business Programs. In addition to having great virus detection, the software also utilizes Norton Insight protection, which is essentially cloud antivirus. It works by Symantec retaining database of 10’s of millions of common PC programs and classifies each one as safe, neutral, or harmful based upon their behavior in a lab. Norton Security Scan then leverages this huge database to classify all programs on ones PC to quickly determine safe and unsafe program within about 5 minutes. In fact, this database is now the largest of its kind in the world and Norton programs are the most frequently updated antivirus available. In fact, the virus research lab releases definitions as frequent as every five minutes. This equates to hundreds of updates a day. In contrast, Free AVG will only provide updates of at most as once a day! attempts to modify system files or is deemed destructive in nature it is quarantine and safely deleted. The sandbox area is then safely deleted and no damage is done to the system. Immunet is also now freely available from Google. Immunet was recently acquired by Sourcefire the makers of open source antivirus called ClamWin. Now one can have commercially available programs, Avast, Norton, and Spyware Doctor, combined with open source user generated definitions, Immunet, to create an effective PC security barrier for ones PC! So you are excited about Google Pack and Norton Security Scan? Well there are many more benefits to these programs than meets the eye. In two simple downloads, one can have the option of installing 4 antivirus programs and 1 antispyware programs from leading vendors. I am not aware of other places online where one can get all of these programs in one place. 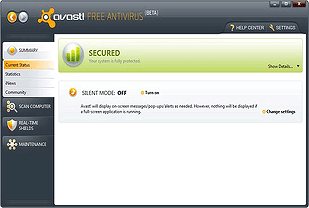 And, if for some reason you are not satisfied with these offerings, simply look below, and see hundreds of other free antivirus categorized and reviewed by freeantivirushelp.com. You literally can find an antivirus to fit your lifestyle. For example, do you have a laptop, or netbook and you constantly concerned about battery life? Well Prevx or Microsoft Security essentials will make a great match because of their low battery usage. Are you concerned about Trojans? Well check out Kaspersky Internet Security with its own built-in virtual keyboard. This keyboard will help you avoid keyloggers. 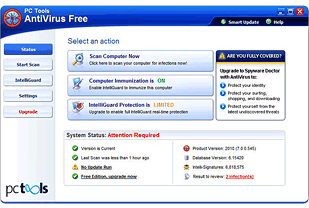 Then to be extra safe see Emsisoft’s Anti-Malware which has the best Trojan detection in the industry. So, really is an antivirus for every situation.